Whenever I eat out, I have this general policy: The restaurant and it’s food must either be freaking awesome(regardless of price), or else I would rather head down to some food court or coffeeshop in an attempt to budget(I can’t believe how my economic rice managed to spiral to $7.70 at Wisma’s Food Court last Wednesday…) for my next freaking awesome meal. The Modesto’s @ Vivo is very family friendly. Nothing too fancy bout the decor and with the construction of Resorts World almost complete, I can imagine the view at night would be great, with the lightings over at Sentosa and all. 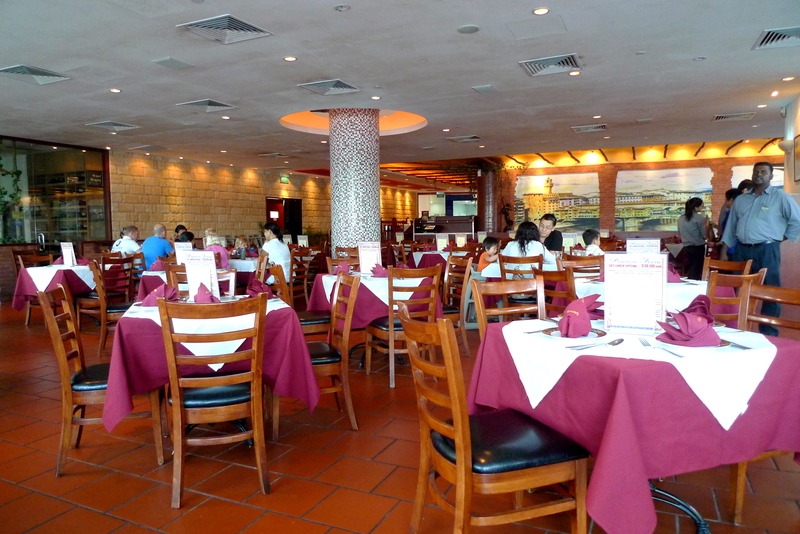 Here at Modesto’s, instead of the customary complementary Bread Basket that Singaporeans love so much, they ask instead if you would like Garlic Bread($6++) to start off the meal. I didn’t ask but if there was a choice of complementary bread basket over this Garlic Bread, I would surely have taken it. 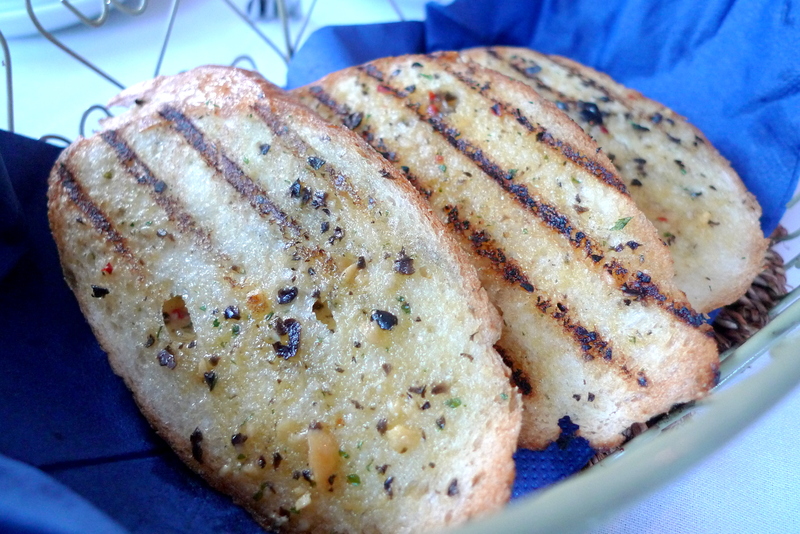 The 3 pieces of Garlic Bread were drenched in oil, soggy and chewy, to the extent that it was hard to tear…using my teeth. I would rather have bought 4 Breadtalk buns and settled my dinner with $6 there and then. For the $48 Nett Set dinner, you get a choice of 1 Appetizer, 2 Mains & 1 Dessert. It sounds inadequate but trust me, the portions are so ginormous here S and myself wouldn’t have finished this even without the Garlic Bread(thank you very much for wasting stomach space). I would have preferred the Caeser Salad but since S doesn’t care for my concerns of her getting colon cancer, piles or constipation in the near future, we had the Mushroom Soup instead. Anyway, I figured Mushrooms ain’t that bad, it contains Chitin which acts as roughage in our digestive tracts in place of the Cellulose found in Plants. 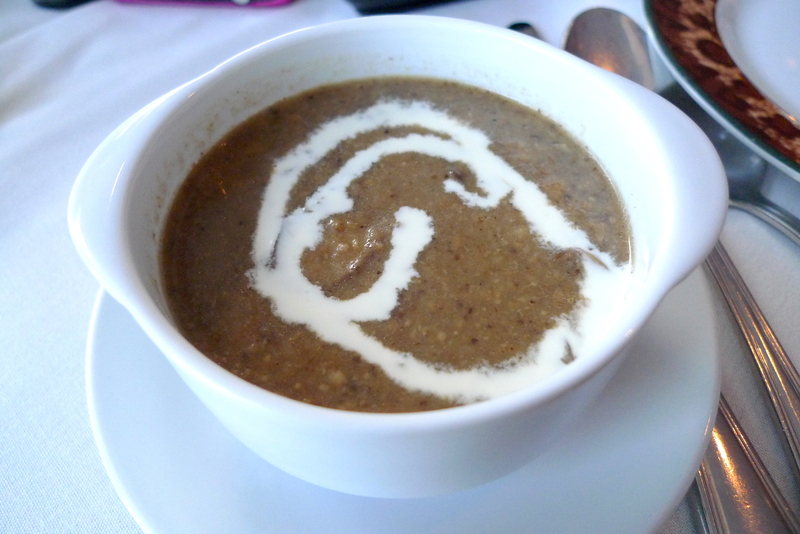 Science facts aside, I unexpectedly really loved this Mushroom Soup, which was divided for us into 2 bowls! S found it a tad salty but I thought it was perfect and with all the different types of mushrooms blended together, makes for a pleasant earthly starter. The Chicken Sausage Pizza was next up! Modesto’s prides itself on making traditional Italian Wood-fired Pizzas and it’s thin crusted pizzas have earned my respect. 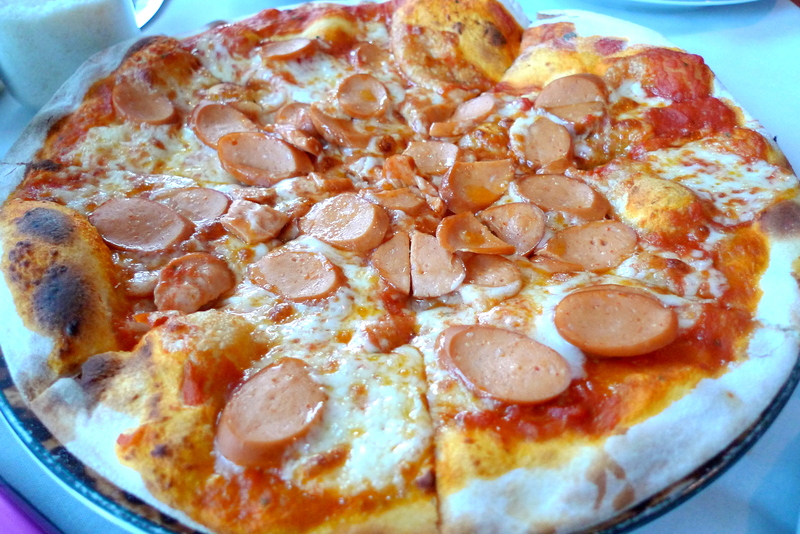 I love how the crust was not made soggy with the tomato base and cheese but on the other hand, I’m not really a fan of sausages on my pizza. S forgot there was actually another main coming up because this pizza was so amazingly huge for 2 people to share. I’m a boring person. 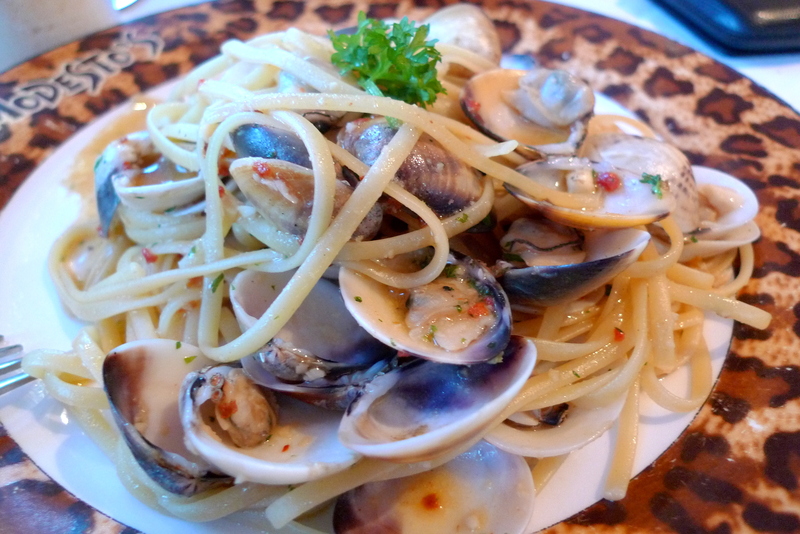 This is probably my 3rd Linguine Vongole this month but at least, this makes me somewhat of an expert on it now right? Not to bad I thought, some irritating sand particles here and there and with slightly too much salt and oil, that’s about all the feedback I can garner. 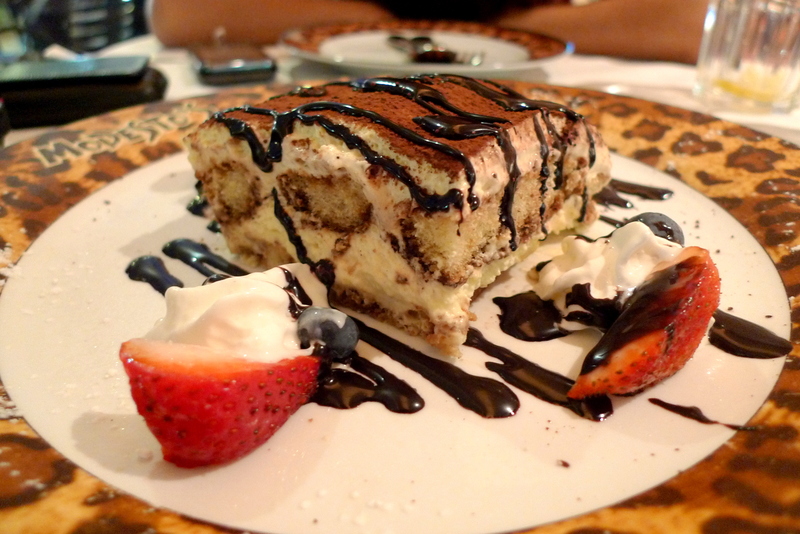 An Italian Classic; The Tiramisu. The Mascarpone was more cream than cheese but with Tiramisu, I have learnt that there is no best 1 in the world. Only the 1 most preferred by the individual. So, while I would say I liked this Tiramisu, it’s not my most preferred. 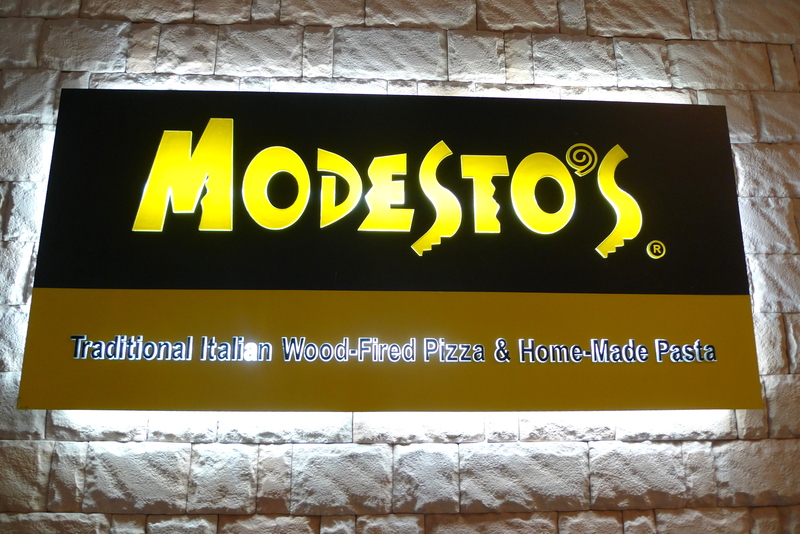 While I hate shopping centres for their lack of restaurant choices, mainly because the same restaurants chains end up sprouting in every shopping centre, I would definitely consider Modesto’s again for their simple fuss-free Italian fare.